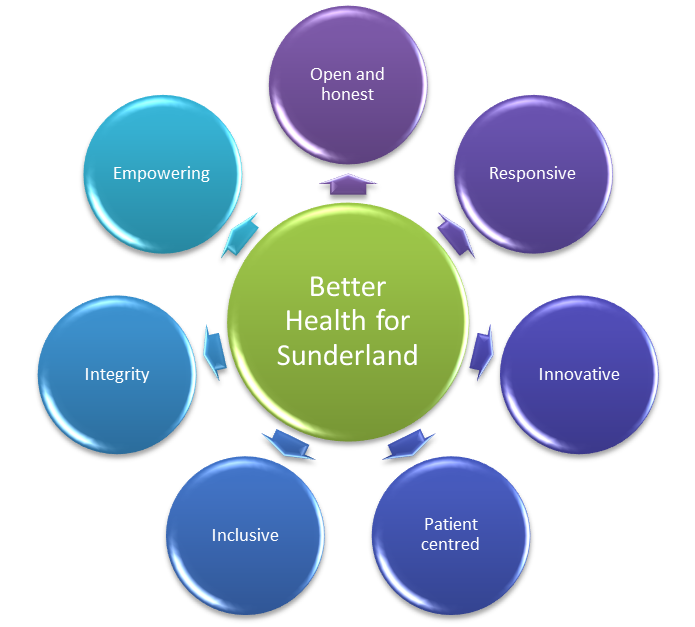 NHS Sunderland Clinical Commissioning Group’s (the CCG) vision is to achieve ‘Better Health for Sunderland’. We aim to improve the health and wellbeing of local people so they live longer with a better quality of life. Enabling self-care and sustainability to ensure the NHS can survive and thrive in the future. We aim to meet these objectives by having a whole system approach, working closely with citizens, patients, carers, providers and partners to utilise evidence based service improvement techniques to maximise ‘value adding’ activities. We have adopted the evidence based North East Transformation System (NETS) as our reform methodology and will adopt other complimentary approaches as needed. We have a passion for improving health and health services for the people of Sunderland and to achieve this we will work with patients, carers, service providers, partners and our stakeholders. To address these priorities we work closely with the local community and engage with a wide range of local partners to ensure the very best health and social care for our patients. We work collaboratively with Sunderland City Council and other partners as part of the Health and Wellbing Board agenda and have developed relationships with Healthwatch Sunderland to ensure we take into account the views of people who use health and social care services. We regularly engage with the community and voluntary sector as they provide an important voice for patients, and invaluable insight into the health challenges faced by local people. We use all of our clinical and managerial expertise, knowledge of our patients, our relationships with other NHS organisations, our local authority, local hospitals and other partners to follow best practice and use evidence-based medicine to commission health services that will ensure we delivery our vision of ‘Better Health for Sunderland’.